Some fans have waited over 40 years for this next item. And it doesn't disappoint. Parody King and Pop Music legend 'Weird Al' Yankovic is finally getting his own action figure! In fact, he's getting several. But today, we have a look at the flagship launch of this new line, which shows the legend in his prime. NECA is bringing a whole line of 'Weird Al' Yankovic action figures to a store near you later this year. We don't have an exact street date. Nor do we have any confirmation on which 'Weird Al' figures we may see. Though, the fan outcry for a Fat action figure based on the hit single from the comedian's seminal 1988 release Even Worse sounds like a sure thing. 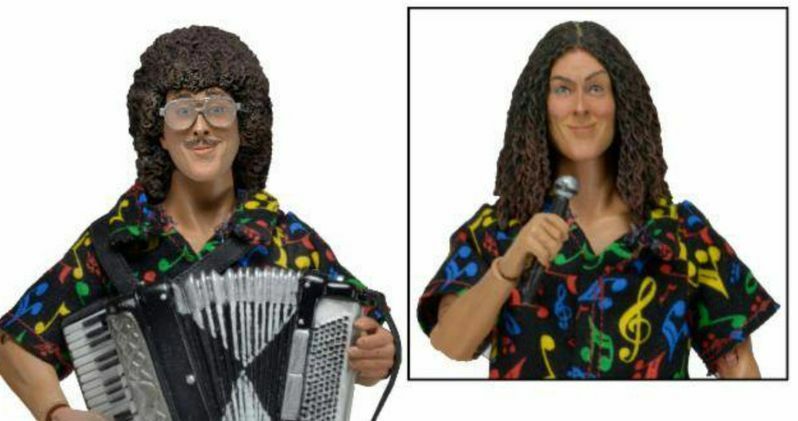 The first 'Weird Al' Yankovic figure comes with two different custom-made heads. The first is vintage Al with his short afro, glasses and mustache. The second head is current Al with his long curly hair, sans the signature mustache and glasses that he rocked through the 80s and part of the 90s. Both heads are included with the first action figure, which stands in his signature Hawaiian shirt and checkerboard Vans sneakers. His accessory? An accordion, of course! 'Weird Al' Yankovic himself made the announcement this morning, stating the following. "I'm excited to announce that NECA Toys will be doing a whole line of Weird Al action figures!" This isn't the first time NECA has brought 'Weird Al' Yankovic into the realm of toys. They did do a special Al action figure for the 25th Anniversary line of The Simpsons. But that version arrived in the signature Simpsons style with the weird one sporting yellow skin and a cartoon demeanor. This latest action figure is much more life-like and accurate to the man himself. It is expected that we'll see more from the NECA 'Weird Al' Yankovic action figure collection at next week's New York Toy Fair. It is suspected that there will be figures devoted to both some of his biggest Parodies, but also figures based on UHF, which could give us the first ever Stanley Spadowski action figure, based on the likeliness of Michael Richards. What do you think? Are you excited to get your hands on your very own Al?